ARRIVE IN NAPLES, ITALY. Check into your hotel. The rest of the day is free to start exploring Naples, one of the oldest continuously inhabited cities in the world. Tonight, meet your Tour Director and fellow travelers. 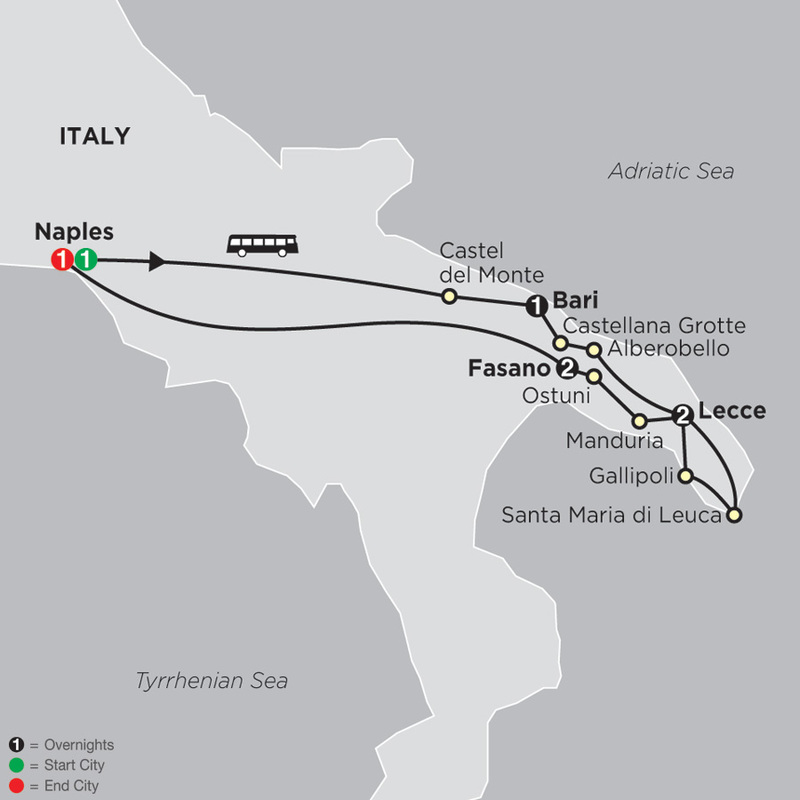 NAPLES–CASTEL DEL MONTE–BARI. Guided sightseeing this morning gives you an introduction to the eventful history of this city and its colorful traditions. Depart Naples and travel into Apulia, the legendary “boot” of Italy. Stop at CASTEL DEL MONTE, built in the 13th century by Holy Roman Emperor Frederick II and renowned for its unique octagonal towers, now a UNESCO World Heritage Site. Continue to the Adriatic coastline for an orientation of the beautiful port city of Bari. BARI–CASTELLANA GROTTE–ALBEROBELLO–LECCE. Head to Castellana Grotte to visit the area’s famous limestone CAVES. This impressive system is a wonderland of captivating stalactites, stalagmites, and crystallized mineral deposits. Next stop is Alberobello, renowned for its distinct conical-roofed TRULLI houses. Follow the coastline to lovely Lecce, the “Florence of the South,” and marvel at its opulent baroque buildings from the 1600s. LECCE. EXCURSION TO SANTA MARIA DI LEUCA & GALLIPOLI. Spend some time on your own this morning to explore Lecce’s baroque city center. Then, travel to Santa Maria di Leuca, the southernmost tip of Apulia, where you'll discover oriental art nouveau villas and beach huts from the early 20th century. On to Gallipoli, an ancient Greek city built on an island in the Ionian Sea. Enjoy the Old Town with its quaint ambiance, winding streets, and inviting squares, and discover FRANTOIO IPOGEO, an underground olive press buried in the tufa rock. Between the 16th and 19th centuries, workers pressed Gallipoli’s olive oil, which was stored in cisterns beneath the Old Town and used to light the city’s oil lamps. Return to Lecce in the late afternoon. LECCE–MANDURIA–OSTUNI–FASANO. Start the day visting Lecce, the city with a total Baroque look. On to Manduria, situated in the wine-growing region, where you’ll visit a WINE CELLAR and get to taste some of the typical Primitivo. Next stop is Ostuni, only 42 miles from actual Greece, but characterized by its flat-roofed, white, Greek-looking town centre. Overnight in Fasano, a peaceful town surrounded by olive groves and vineyards, not far from the Adriatic Sea. FASANO. Today is free to do as you like. Maybe join the optional excursion to Matera and Altamura. The impressive “rock city” of Matera is home to the prehistoric sassi cave dwellings, while a guided tour reveals the amazing stone-clad city of Altamura, with free time afterward to stroll through the Old Town on your own. NAPLES. Your vacation ends with breakfast this morning.